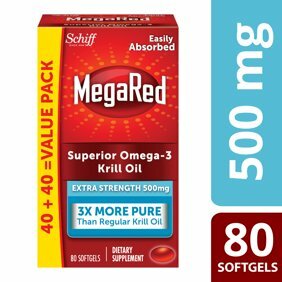 Why Choose MegaRed Extra Strength Superior Krill Oil? MegaRed Omega 3 Krill Oil supplements provide an optimal combination of omega-3 fatty acids and the powerful antioxidant, astaxanthin, to support heart health in an easy-to-swallow, once daily softgel. * Supportive research has shown that consumption of EPA and DHA omega-3 fatty acids may reduce the risk of coronary heart disease; MegaRed Omega-3 Krill Oil has been shown to significantly increase your omega-3 index in just 30 days. 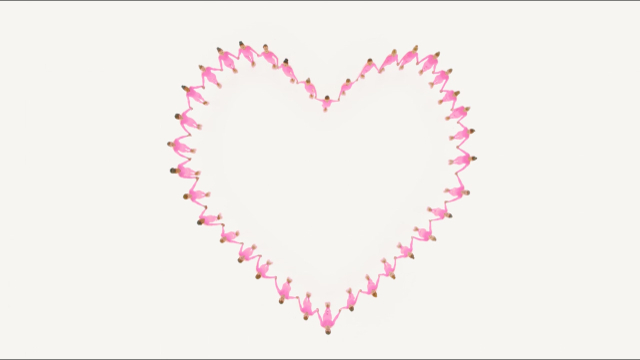 * MegaRed Krill Oil is absorbed and carried in phospholipid form so it is easily recognized and used by your body. MegaRed uses Sure Dissolve softgels that are formulated to dissolve within one hour. They're smaller than standard fish oil pills, making them easier to swallow; and because it's krill oil and not fish oil, there is no fishy aftertaste. MegaRed Extra Strength Superior Omega-3 Krill Oil contains 500 mg of 100% Antarctic krill oil in just one easy-to-swallow softgel, providing even more omega 3s. MegaRed Krill Oil contains high quality oil from 100% pure Antarctic krill. The removal of salts and other impurities makes MegaRed 3X more pure than regular krill oil, making it the Superior Krill Oil. MegaRed Superior Omega 3 Krill Oil contains no preservatives, no artificial colors, and no added sugar (sucrose, fructose, lactose), salt, yeast, wheat, gluten, or milk. Krill is one of Earth’s most abundant and sustainable organisms. The harvest of krill is well below conservative international catch guidelines, but MegaRed goes a step further and only sources krill from the Antarctic where krill are most abundant, helping the ecosystem maintain a healthy, sustainable krill population. MegaRed krill oil is independently certified to the MSC’s standard for a well-managed and sustainable fishery. **Supportive, but not conclusive research shows that consumption of EPA and DHA Omega-3 fatty acids may reduce the risk of coronary heart disease. 98% of people are not consuming enough omega-3s through diet alone. Get your omega-3 score and find out if YOU are getting enough of this vital nutrient by taking the Know Your Omega 3s Quiz below. A once daily softgel provides 500 mg of 100% Antarctic Krill Oil. 3X more pure than regular krill oil with the removal of salts and other impurities. MegaRed Krill Oil is carried to your body's cells in phospholipid form, so it's easily recognized and utilized, allowing for easy absorption. Unlike fish oil, MegaRed Krill Oil has no fishy odor or aftertaste. Contains Astaxanthin which provides carotenoid and antioxidant benefits. Uses Schiff Sure Dissolve softgels formulated to disintegrate within one hour. Comes from fisheries that have been independently certified to the MSC's standard for a well-managed and sustainable fishery. MegaRed only sources Krill from the Antarctic where krill is most abundant, helping the ecosystem maintain a healthy, sustainable krill population. Stop Use Indications: People with shellfish allergy, coagulopathy or taking anticoagulants or other medications should notify their physician and be tested prior to taking dietary supplements. If pregnant, breastfeeding or on prescribed medication, consult your physician before using this product. KEEP OUT OF REACH OF CHILDREN. Protected with a tamper evident seal. Do not use if seal under cap is broken or missing. Store in a cool, dry place with lid tightly closed. Gelatin is derived from bovine sources. Ingredients: Other Ingredients: Gelatin, Glycerin, Water, Ethyl Vanillin, Sorbitol. Dosage: Adults take one (1) softgel daily. Instructions: Adults take one (1) softgel daily. Store in a cool, dry place with lid tightly closed. I will be ordering over and over again. Mega Red is something that is doctor prescribed for me and because I take it on an ongoing basis I was looking for a reasonably priced item and found it at jet. Easy ordering and prompt delivery. I have tried different kind of fish oils and did not like them because of the fishy taste. This product does not have fish flavor or fishy burp. It also makes skin little bit darker which I like it. It has antioxidant and phospholipids; both are valuable ingredient and natural for the body. I defiantly recommend this product. I really like the way this makes me feel after taking. I seem to have more energy. Thanks SCHIFF!